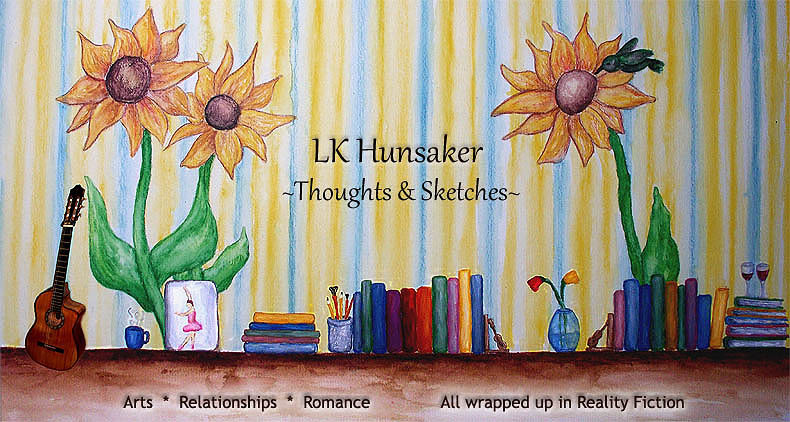 Brief summaries of my published books under LK Hunsaker. At the bottom, I've listed blog links for the Stories Behind the Books, where you'll get insight into the creation of my creations. Combining Finishing Touches with its new sequel Final Strokes, The gallery is the story of a young artist making her way through the art world jungle while balancing children, a burgeoning career, an energetic artist boyfriend, and unresolved issues from her past. It's a story of love, friendship, family, desires, and home. Two novels in one book (or get them separately in E-format). It's About The Journey. The Rehearsal Series is a musical romantic saga beginning in Spring, 1974 and running into the mid-Eighties. Societal aspects of the era highlight family, parenting, and friendship, all behind a story of lingering and passionate romance mixed with laughter and drama. The full series will contain 6 books, and there will be a sequel, plus possibly a prequel. Susie Brooks is a nineteen-year-old dance teacher whose main stability through an uncertain childhood was her best friend, Evan Scott, a guitarist with a flair for the business world. Evan’s other best friend is Duncan O’Neil, also a guitarist, but with a flair for attracting women’s attention while hiding his past. When Duncan moves into Evan’s world, he changes the dynamics not only within the band, but within Susie and Evan’s relationship. The three friends find themselves struggling with love, loss, and secret passions during the turbulent Seventies. A Different Drummer is the first of a series of six. Susie, Duncan, and Evan lead Raucous through the music world jungle heading toward the top. Along the way, family secrets are revealed and new additions come along, and the friends must redefine themselves within their new roles. While making sacrifices and reconsidering relationships, they’ll have to choose between clinging to their current worlds and letting go to explore new possibilities. The Highest Aim is the second in a series of six. The Raucous crew is on the road moving along toward the end of the Seventies. With several number one hits and a UK tour, the band is set for bigger things and larger adventures. Along the route, false rumors and relationship strains abound, and a dangerous curve threatens to overturn their journey. When a sudden explosion rocks them to their cores, the band members, management, and fans question their future. Still reeling from the devastation of a major loss, Raucous flounders in the waves, both as a band and individually. Through the aftershocks, they grasp onto anything that may steady them: old friendships, burgeoning concepts, and new loves. Rolling out of the Seventies into the Eighties, the band must change with the personal and musical tides while trying to stay afloat on the charts. "Riveting" Ryan Reynauld is immersed in a world of music, parties, and temporary companionship. Having risen to the top of the pop charts, his biggest concern is objecting to the way his music is produced. That is, until he finds a young woman standing on a window ledge. Against the advice of family and friends, and through media attacks and fan protests, Ryan determines to care for her himself, making a promise that threatens to destroy his career. Convincing the skittish girl she can learn to trust again comes with a steep price. Sometimes the path to recovery begins by allowing your world to implode. Entrenched on his father's farm in southern Idaho's Snake River Valley, Abraham Luchner pulls up roots to join the war effort. Joined by his friend Cameron Terry, an impulsive adventure seeker, Abe determines to sever ties at home in order to minimize distractions. Daws, aka Sergeant Fred Dawson, U.S. Army, is a determined and highly respected leader. Called to serve in Desert Storm, he performs two impromptu rescue missions and manages to bring his men back home. While still haunted by the cost of his actions, he loses the most important person in his life, in an accident for which he feels partly responsible. Deanna Meyers has had it with men. As far as she's concerned, there isn't a true gentleman left in New York City. In the midst of trying to advance in the world of advertising, she finds herself in another destructive relationship, this time to the possible detriment of her career. When they run into each other at a bus stop in the pouring rain after midnight, Daws and Deanna recognize the spark of a connection that draws them to each other the way they are both drawn to the city lights at night. Stanley is a little raindrop who always finds the hardest places to land. With help from an older and wiser raindrop, Stanley learns the value of hard lessons. Adult coloring books are widely popular recently, as a response to overwhelming hectic lives and large doses of social media, electronics, and a constant barrage of information. The act of putting pencil to paper in a creative activity is calming to the mind. It can also be self-therapeutic. The new Thoughts & Sketches journals combine adult coloring pages with lined and blank pages, plus plenty of prompts that encourage each of us to look inside, to ponder, to revive ourselves with the healing power* of the written word, imagery, and color. Many of the images in the journals are open for completion and/or addition. Add to the half page scenes to create a full page image, or use the open, unlined space to write your thoughts, doodle, or whatever you like. Create your own coloring scenes on the blank pages or use them for unbound writing. Some of the lined pages have extra open space along the edges for doodling, notes, or wherever your own creativity takes you.